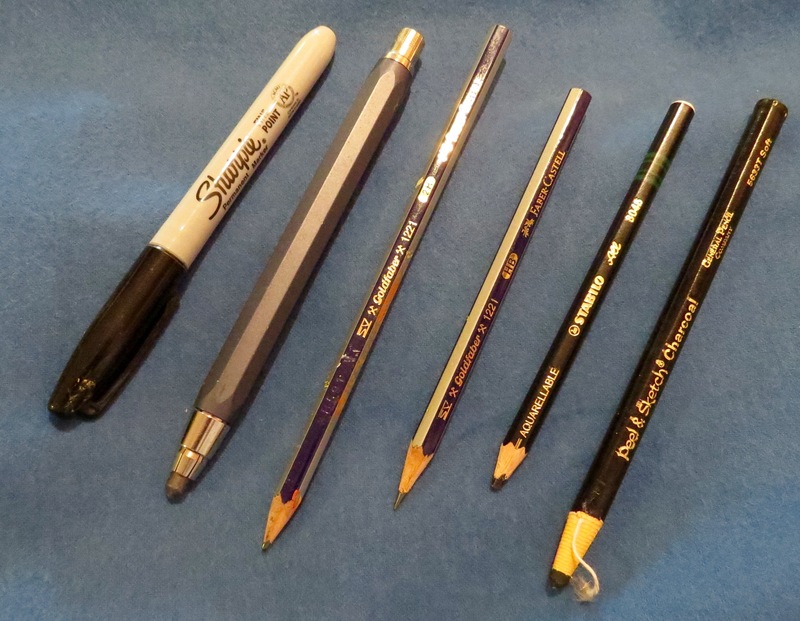 I have dabbled as a wanna-be artist most of my life. And most of my life I was always trying to achieve what I thought was “good” art. But just what is “good” art? How do we define it? How does it make us feel inside? What drives us to express ourselves on a piece of canvas, on paper, in altered book art, throwing pottery, building sand castles, architecture and a myriad of others mechanisms used to express an emotional feeling. Recently I saw a FB posting of a nurse in Canada who had collected pieces of plastic from different products used to treat her patients throughout a 30 year career. Medicine vials come with pretty colored plastic flip caps, syringes with needle caps all of which are thrown away. When she started collecting those pieces of plastic that were never used on a patient, just in product delivery, she said she had no idea what she was going to do with them and throughout the years she used some of them with her children as a sorting game tool and found various uses for others. Finally after retirement she spent time putting all of those different plastic pieces into an artistic collage depicting sunshine and happiness. From trash she created a masterpiece that now hangs in a hospital in Canada and has become a tribute to all of the thousands of patients that she touched throughout her career. For me it is paper. I collect paper. There is something about paper that entrances me. It stimulates me visually and tactilly. I love the texture, the crinkle sound, the smell. And I have a remarkably large quantity of it. 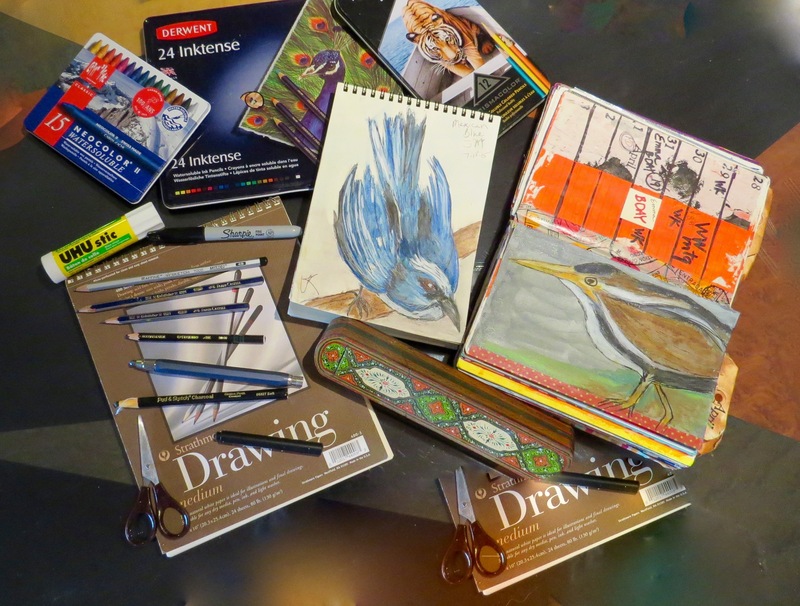 I fill pages with bird sketches, old books with drawings, collages, stamps, envelopes, gathering them together into junk journals and canvas after canvas with my own humble art expressions. 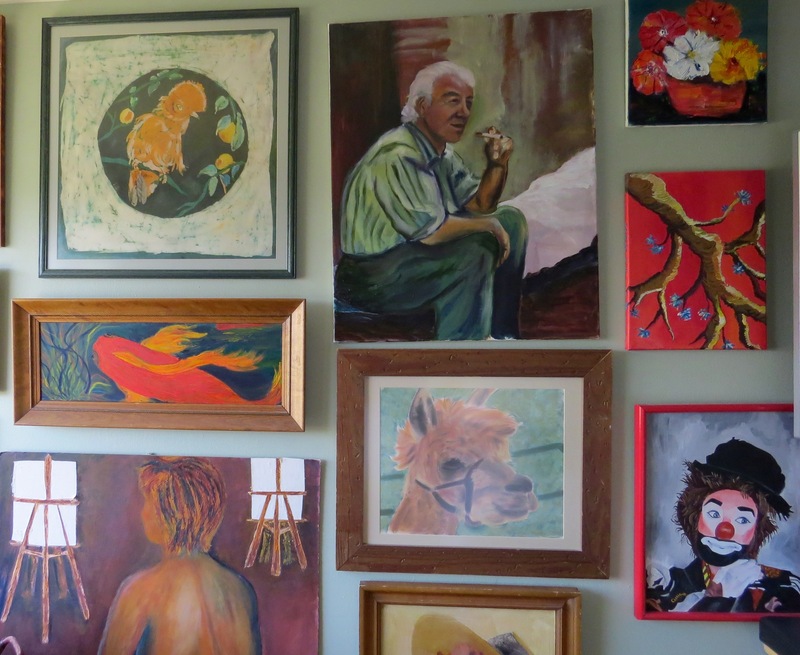 One whole wall in my bedroom is covered with drawings and paintings and it gives me pleasure each morning and night to see them adorning my walls. Some of these remain WIP (works in progress) and others I have pronounced finished. 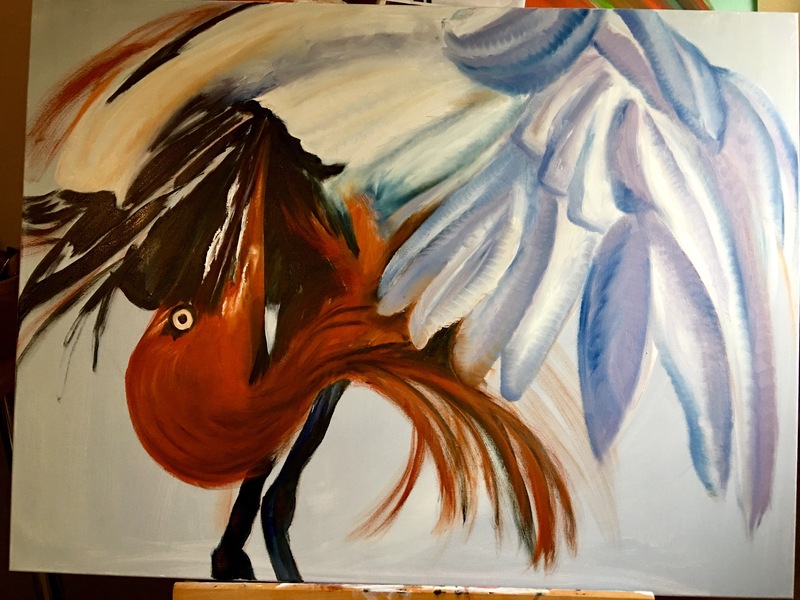 It is hard for me to know when one is done, but over time I have gotten better at this, realizing that when I lose interest, the piece becomes a testament to where I was in my artist journey at that moment in time. And I love the smell of oil paints, tupernoid, linseed oil, and baby oil. 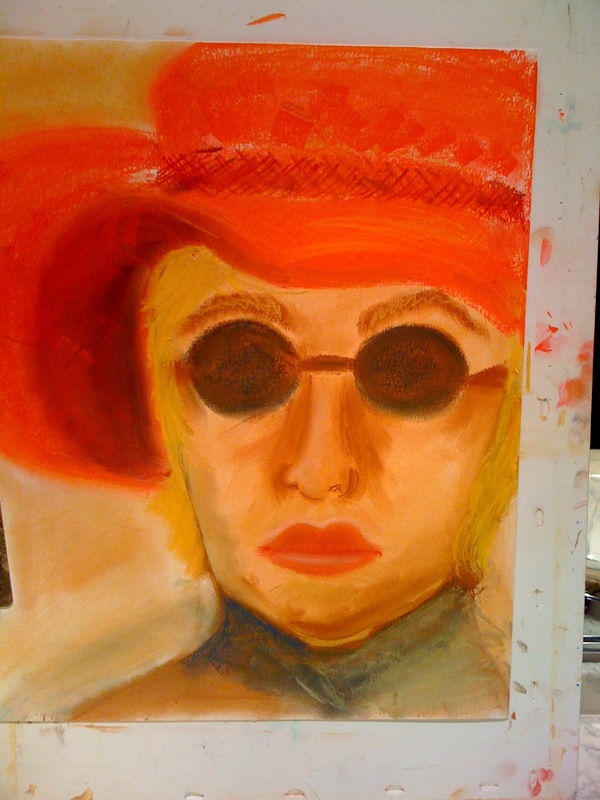 I love the smooth buttery lipstick texture of oil pastels that I can move with my fingers to create an image. I love the fluidity of water colors and I love the excitement derived from the birth of an idea, sketching it, applying the paints and watching the image grow into what satisfies by eye and brain. It is a strange process and I usually am amazed that I was able to create something with these hands. I’ve learned that if I am happy with it, then that is all that matters. I have a “painterly” style and prefer painting alla prima AKA wet-on-wet or paintings done in one or two sittings. Challenges exist when using this technique. Paints can be mixed on the palette or directly on the canvas but mixing wet into wet can produce a muddy mess if not done correctly. It is also important to work from dark to light when painting alla prima. I am however not much of a rule follower, tending to experiment and take a chance that something new may just work! Art remains an avocation for me, an activity that promotes a sense of peace. At this time of year, my thoughts turn to Christmas cards, wrapping paper, gift giving and my studio remains stagnant awaiting my return for my next artistic expression. Oh wait…I need to make a Christmas wreath…clear the workspace, haul out the glue gun, gather supplies and I once again begin the creative journey! I mentioned previously about taking a sparrow class in an attempt to demystify some of the little brown birds that all seem to look alike. Our instructor, Dr. Birdie, has great knowledge about these members of the bird world and did a great job of imparting his knowledge to us. We would meet Wednesday nights to discuss and view different sparrows common to the Austin area, learning their markings, differences, and preferred habitats and haunts. 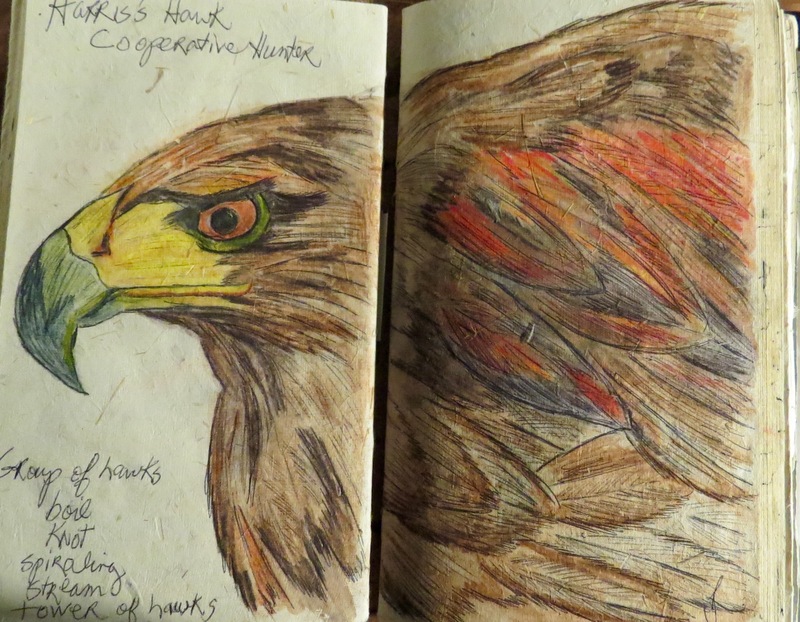 The field notes provided were used by me to sketch and paint the different birds in my attempt to help my brain remember some of those characteristics. 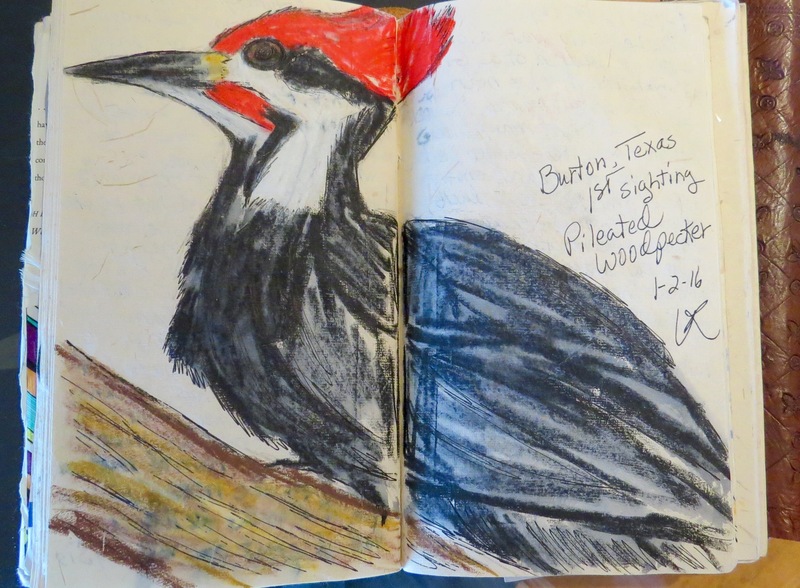 On Saturdays, we had our field trips to different popular birding areas in the Austin area to try to actually locate and get up close and personal with some of the birds we studied. Some of the ones we were chasing were obvious…black throated sparrow, rufous crowned sparrow but others are so similar that I am still having difficulty determining the accuracy of my sightings without Dr. Birdie there to help guide me through the identification process. Small birds move quickly, darting in and out throughout grasses, bushes and shrubs. This rapid movement makes it challenging for my identification skills. We trudged our way through waist-high grasses and tried to surround one La Conte Sparrow for at least 30 minutes. In the end the sparrow won, flying easily away each time we though we had cornered him leaving behind some very tired and frustrated bird searchers. Did I see the bird…yes. Could I identify him again if he sat still long enough for me to study his markings…perhaps. The only thing I “caught” for sure on that particular day were some chiggers. I have learned over the past few years that improving my bird identification skills is a long-range process. And slowly but surely, I am getting better. But at the rate I am progressing, I will probably expire before I become a super expert. That really doesn’t bother me though because I still get excited with each bird I see, my eyes constantly scanning my surroundings just in case something new and different or old, tried and true appears within my scope of vision. You see, it is the thrill of the hunt, the excitement of the sighting and the satisfaction of making the identification that bring an immeasurable amount of joy into my life. As I was driving to work this morning I found myself thinking about the everyday minutia that comprises are lives…commuting to work, grocery shopping, putting gas into our car, cooking meals and actions as mundane as brushing our teeth. On workdays, I always set my alarm for approximately 2.5 hours prior to my “I need to leave for work now” time. I enjoy drinking a couple of cups of coffee, reading the newspaper and generally easing into my work day. Driving to work there is always the possibility of seeing a Great Blue Heron flying over the freeway or a Red Tailed Hawk perched on one of the freeway lights. And of course, the whole world abounds with rock pigeons, white wing doves and the ever-present grackles. At work we have many house sparrows flitting in and out of the trees around our building. Last Spring I heard a bird calling in distress and opened the door to investigate. 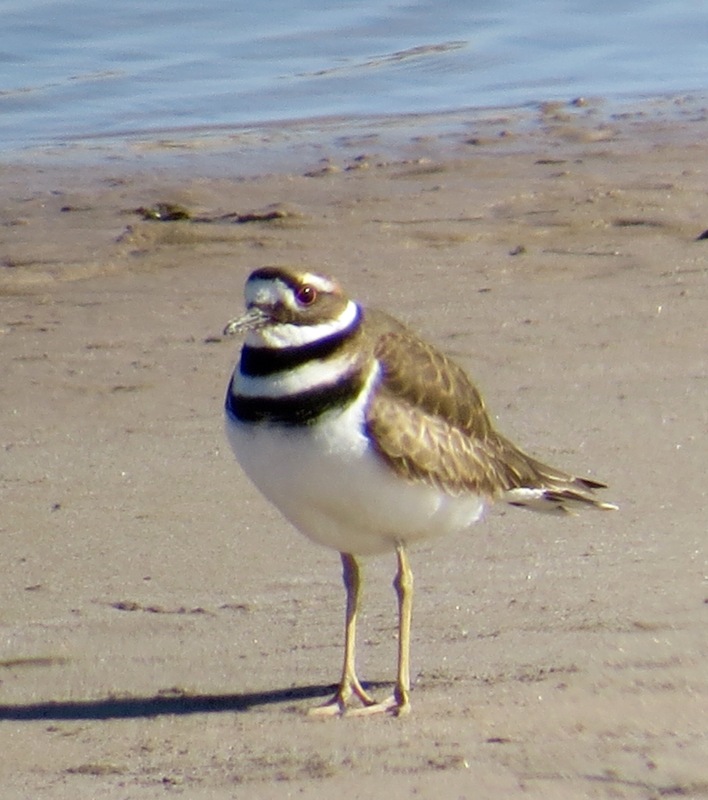 I spotted a killdeer frantically trying to encourage her two babies back into the grassy area. Her chicks were so very tiny yet totally complete birds and they were running here and there completely unaware of the dangers that surrounded them. I cheered the parents on in their efforts to conjole their offspring, but I am sad to report that they were unsuccessful with at least one of them. These chicks were so small (very mobile, but tiny!) and as I watched, a car passed directly over one of them. The car’s tires didn’t crush him, but the air draft from the car passing over him tossed the chick against the underside of the car and a tiny fragile life was instantly extinguished. I was devastated. I cried and cried, frustrated that I could do nothing to prevent it. Although I don’t know for sure the fate of the other chick, I prefer to believe that he successfully navigated back to the safety of his parents. Driving home in the evening, I pass a football field complete with those extremely high lights necessary for illuminating a night-time game. On the platforms just under these lights, monk parrots build great colony nests and raise their young. I once spotted a hawk hanging out near them….great hunting ground for his dinner no doubt. Once home, the birding from the balcony kicks in. With binoculars or my spotting scope I can watch the snowy or great egret or the Great Blue Heron as they fish for their last meal of the day before settling in to roost for the night. It is a peaceful sight. Nothing really unusual about the day but since I started my birding adventure, my world has expanded greatly and my observation skills regarding my surroundings have grown exponentially. An ordinary day can be filled with extraordinary drama. I love the drama! Happy bird searching in every ordinary day!!! 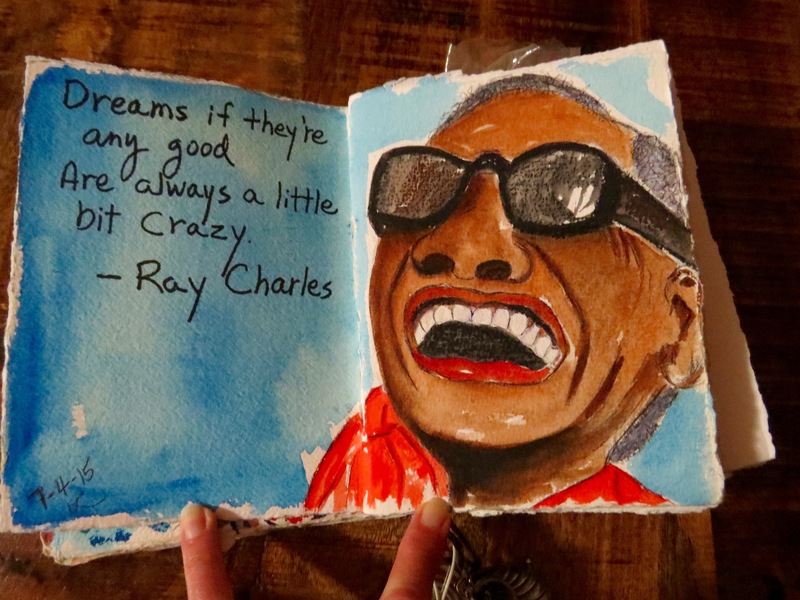 As long as I can remember, I have drawn, sketched, colored, painted and in general taken great joy in piddling in different mediums in my feeble attempts to be an “artist”. It took me years to learn that as long as I was happy with my creation, that was enough. I have finally lost the need for perfection or approval. 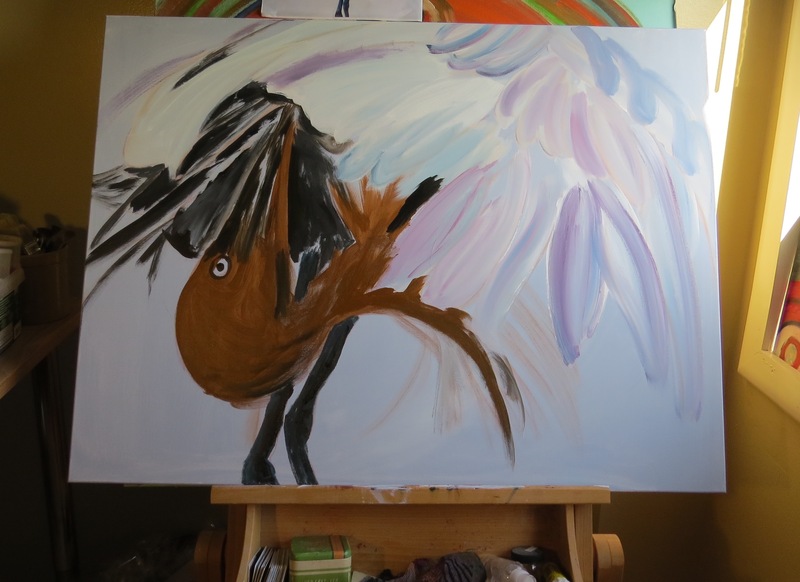 I am happy when I can capture the essence of a bird or a landscape or a human figure. I guess that makes me an impressionist. Whatever I am, it matters not. 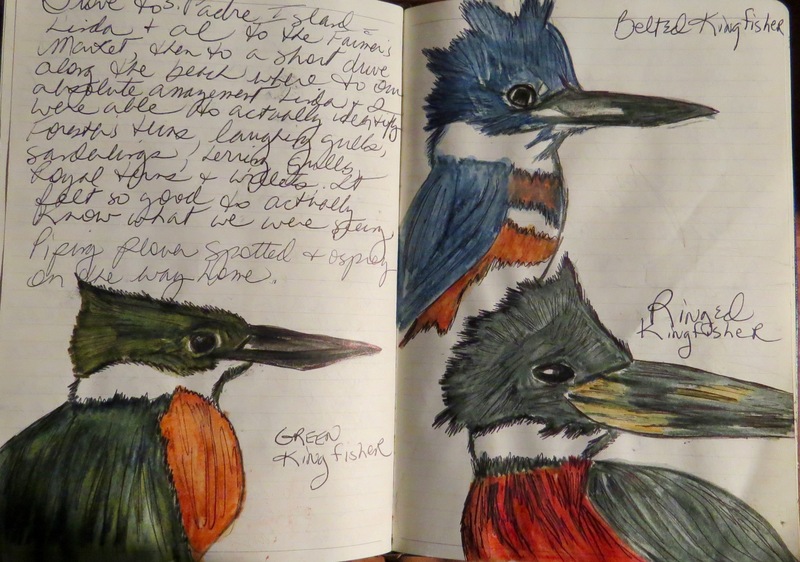 I derive great pleasure from sketching my birds and revisiting those pages in my journals to revive the memories of their sightings. The list could stretch on and on. Experiment, try new products/papers. 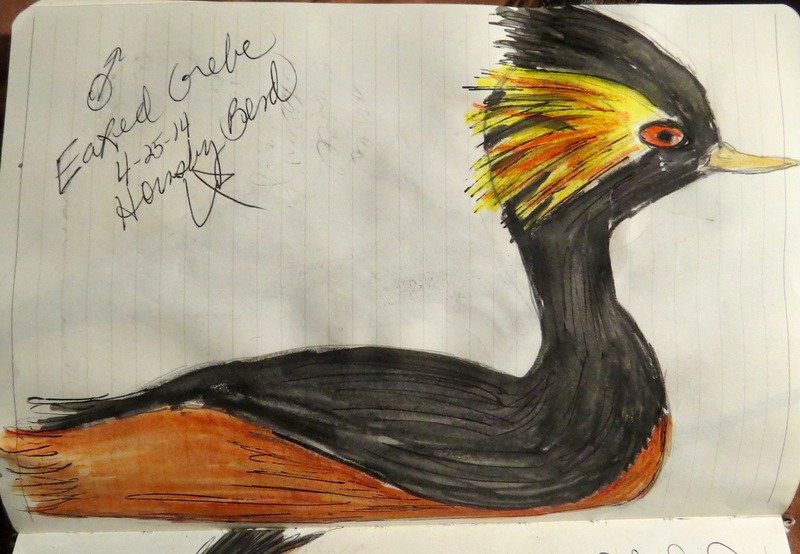 It doesn’t take long to find your “go to” favorites that help you capture a memory in a birding journal. 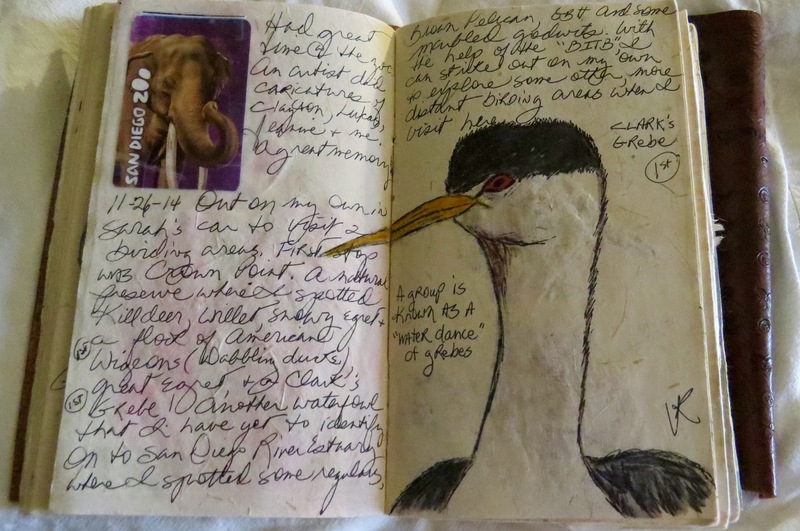 Paste in beach passes, restaurant receipts, print a photograph and lay it into the journal. Make your journal yours and build memories along the way.